1. Line 7 inch (6 – to 7-cup), heart shaped mold with foil. 2. In small saucepan, combine sugar with 1/3 cup water. Bring to boiling over medium heat, stirring until sugar is dissolved. Boil gently, without stirring, to 230F on candy thermometer, or until a little of sugar mixture spins a thread when dropped from spoon. 3. In medium bowl, with portable electric mixer at medium speed, beat yolks and salt until light. Gradually beat in hot syrup, in thin stream, beating until mixture begins to cool – 2 minutes. Stir in macaroons. Refrigerate 30 minutes. 4. Sprinkle ladyfingers with Grand Marnier; set aside. Combine 1 1/2 cups cream with extracts; beat until stiff. 5. With rubber scraper, fold whipped cream into macaroon mixture. Turn half of mixture into prepared mold; cover with ladyfingers; pour in remaining mixture. Freeze until firm – about 4 hours. Make Raspberry Sauce. 6. 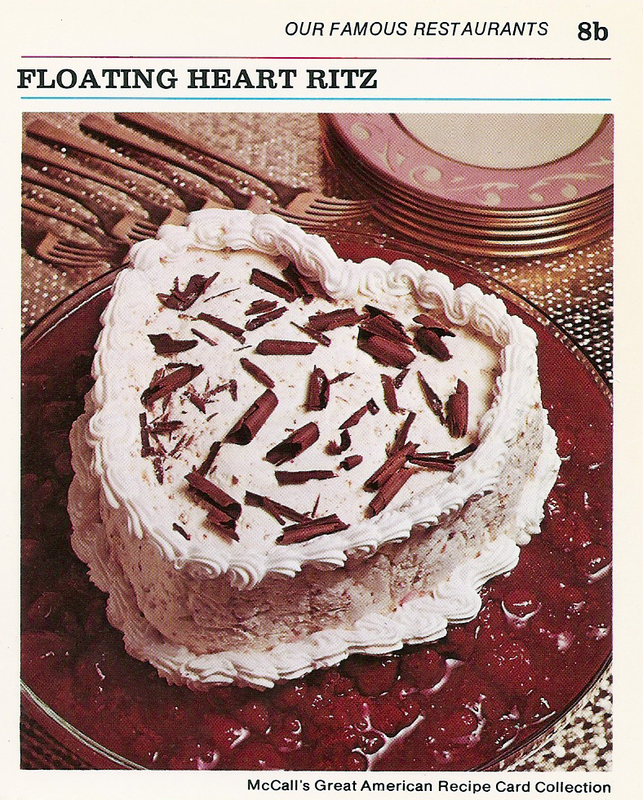 To serve: Unmold frozen heart onto chilled shallow dish. Spoon sauce around. Decorate with whipped cream. Garnish with chocolate curls. Serves 10. Based on the recipe, I’m sure it’s delicious. But in the photo it looks as though the cake is floating on entrails.